Currently, he is a Project Director in Centre for Entrepreneurship, CUHK. 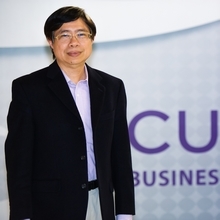 He is also a Non-Executive Director on the Board of the Hong Kong Business Angel Network. He is a Member of the Assessment Panel of the Enterprise Support Scheme Program (ESS) of the Hong Kong SAR Government. Member of the Assessment Panel for HKSTP, Incu App programme. His current area of interest is Cybersecurity, Fintech, IOT and Biomedical. He has over 29 years of experience in private equity, M&A, investment management, corporate finance and PE operations in USA and Asia, formerly member of the Investment Committees in Shenzhen Capital Group and Standard Chartered Bank Private Equity Pte Limited. Invested in over 200 companies in USA, Singapore, Taiwan, Malaysia, Hong Kong and China. He was an active Director on the Boards of Companies and the funds he managed after investment. Formerly, he was the Chief Investment Officer, Eagle Ride Investment Holding Limited (0901.HK), prior to that; he was the Founding General Manager of Tangshan (Shenzhen) Investment Pte Limited. He has held senior investment positions in various firms including Huawei (Head of PE/VC Investments), Shenzhen Capital Group (General Manager) and Standard Chartered Bank (Managing Director of Private Equity). His investee companies have been listed in Singapore, Korea, USA, Hong Kong and China. He graduated with a B.Sc in Physics from the National University of Singapore and obtained his M.Sc in Communications Engineering from the University of Bradford, UK.